No luck getting ahold of the doctor today. Still no luck with Dr. S. I called in the morning and left my work number, but he didn't call back until after I left in the evening. Tomorrow, I'll call in the morning and leave him my pager number. Julia has been complaining about a backache for the past couple of days. It appears to be localized to her left lower back, and she says it feels better after someone rubs it for a while, and also if we put a heating pad on it for a while. This leads me to believe that she just pulled a muscle. She's done stuff like that in the past, but she's usually forgotten about it the next day. Now, as warned, she seems to heal more slowly -- bruises are slow to heal, aches take longer to go away. Fortunately, we haven't had to deal with the extra colds and flu we were expecting. I finally spoke to Dr. S after he paged me. I think I'm just going to give the doctors my pager number from now on when I leave a message. He assured me that Julia's recent bump in her lab tests were "no cause for concern", and that her dosage for Methotrexate was low to begin with for treating JDMS. He went on to say that he chooses to treat JDMS more aggressively, that other doctors might have done nothing as a result of these test results because Julia is doing so well and she's so strong. He explained that medication is necessarily a process of trial and error, and ultimately correct doses are individually determined by absorbtion, metabolism, and reaction. I asked if maybe we should slow down tapering the Prednisone, but he assured me the the course we're on is the right one, especially given Julia's strength, overall good condition, and improvement in her rash. I guess that means we drop to 20mg Prednisone Monday, as scheduled. Julia got her second 20mg dose of Methotrexate today, and thankfully continues to show no side effects from it. We did step on the scale today, and our bathroom scale showed Julia at 72lbs, which tends to be about 1-2lbs higher than the scale at the hospital. Sigh. She went to a birthday party today, and ran around for over 3 hours. Afterwards, she complained about general tiredness, which naturally set off alarm bells in my head; I was worried that it may be something to do with the Methotrexate. I think she was just hungry, after we had some food she felt better. Which reminds me, her appetite thankfully continues to be under control. Julia took the Sacrament of the Sick today, first time since April because we were on vacation last month. Julia drops to 20mg of Prednisone today, and she's happy that she can take just that one 20mg tablet, at least for the next week and a half. The medicine schedule is now 20mg Prednisone and 200mg Plaquenil daily, and 20mg Methotrexate weekly. Speaking of Plaquenil, I saw on an email list where some people think that name-brand Plaquenil is more effective than it's generic equivalent, Hydroxychloroquine. Someone who has the same doctor as julia, Dr. S., asked him about it, and he didn't think there was anything to it, but wrote a Do Not Substitute prescription for them anyway. Julia's rash is clearing up very well, much better than we expected, so I think we're going to stay with what we're doing for now. I'll keep this in mind if either the rash gets worse, or if it doesn't keep getting better after a reasonable time. We've finally gotten into a routine where Julia gets sunscreen every morning before school. Every day, she gets it on her face, neck, and ears. On sunny days when she's wearing short sleeves, she also gets it on her arms, and if she's expecting to be outdoors any more that a recess period's worth (15 minutes), her legs get it too. We've been using up the SPF 50 "face" stuff, but when it's gone, we'll be using Coppertone "Shade", which was recommended to us by an emailer. We tried it a couple of weeks ago, and Julia like the way it feels and smells. Julia's school had a "Field Day" today, which means everyone spent today (which is *beautiful*) playing outdoors. She got an extra-heavy layer of sunscreen all over today, and despite being outside during the most sunburn dangerous 10 AM to 2 PM period, her skin showed absolutely nothing. Julia complained about being tired again this afternoon, even though it was a miserable rainy day and she didn't do any running around. It could be a coincidence, but she had her 20mg of Methotrexate this morning, and she's tired again this afternoon, just like last week. I'll keep an eye peeled next week, and mention it to the doctor when we go later this month. We went to a party last night, and Julia played outdoors with a bunch of other kids. Today, she had several mosquito bites, and a touch of poison ivy (just a few bumps on her leg and face - they're a different color than her JDMS rash). Put a little AfterBite on the bites, and Calamine on the ivy. We also realized that the Prednisone will help prevent this from getting very uncomfortable for her. How about that - a positive side effect! We got a call about the JDMS study going on in Chicago (Hi Ed! ), and I set up an appointment to be interviewed next week (report to follow). I referred him to this web page for background information. He also said that we'd do another phone interview in a few months, which is OK with me. I did the interview for the JDMS study this morning. The questions were detailed, regarding Julia's symptoms and her progression with the disease. He said that he read this web page (and Julia's and my home pages as well), and that having this information here made the interview go a lot quicker. Good thing! It laster about 45 minutes as it was. The questions were concentrated on the 3 month period before her first onset of symptoms, basically the last quarter of 1997. He asked about a myriad of things that she might have been exposed to in that time frame. I found it rather interesting what was being asked, some things were surprising. It felt good to be able to help out; the study may reveal some information about JDMS that helps treatments or improves detection techniques. Julia's last day for the school year. She alternates between cheering for the end of school, and then being sad because she'll miss her friends and teacher. Anyway, her report card is *awesome*! She really finished the school year on a positive note, despite dealing with JDMS and taking a week off for vacation. She improved her already-good grades to simply outstanding levels, and all her attitude marks (Effort, etc.) were great. For example, her math grade went from B+ the first 2 quarters, to A- the third, and a solid A for the final quarter! Of course, we see her papers every day and they're usually perfect, but it's hard to know how she compares to the other kids, and how it translates to grades. She was given a summer reading list to prepare her for second grade. They can read other books not on the list, too. Good thing, because the reading list is very basic for Julia's reading level. She's well into 3rd and 4th grade books already. For the summer reading, they have to cut out a sailboat shape on paper, and write the title and author on one side, and a quick summary of the book on the other side. At least one parent has to sign each sailboat, too. On the first day of school, everyone is supposed to bring in all their sailboats put together with a ring or some string. I have a feeling she's going to have a lot of sailboats by September. Prednisone dosage has been reduced to 16mg today. Julia had Dance Recital today. In fact, this year her dance school had *two* recitals, one at 2 PM, and the second at 5 PM. 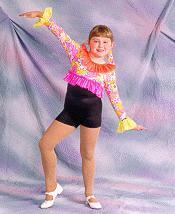 Her class was the youngest that performed at both shows; the younger kids only had to be at the early performance. She had to wear her costume all afternoon and into the evening. She danced two numbers with her class ("Blueberry Pie" and "ABC"), plus two finale numbers. She danced beautifully (no partiality here :) - she knew all her steps, she actually smiled and looked like she was having a good time up there. As with the last two Saturdays (when she got 20mg of Methotrexate), she complained about being tired at the end of the day, but I'm tired just thinking about that schedule! We'll mention it to the doctor next time, but I don't think it's a problem. Dr. A.W., who moved and was on a 2-week vacation, called tonight just to see how Julia was doing. We thought that was a very nice gesture, and we all appreciated it. We talked about how Julia is still doing well strength- and stamina-wise, ans how her rash is clearing up. We also had a couple of questions saved up. We're on a Prednisone reduction schedule that has us reducing the daily dose by 4mg every 10 days. We're scheduled to drop again, to 12mg, on the 28th, but Dr. A.W. hadn't written this down on her schedule at our last visit. We asked if we should go ahead and make that change, but she said not to, just stay at 16mg until we see the doctors again. We asked about Julia's Saturday tiredness, and she said that she hadn't heard that that was a side effect of Methotrexate at all. We'll keep an eye on her again this weekend, and we'll mention it to Dr. S. when we see him. My other question was I had heard that name-brand Plaquenil (with the prescription written as "no substitutions") was more effective than the generic equivalent, hydroxychloroquine. Some parents had said that they noticed a dramatic improvement in the rash when they made the switch. She hadn't heard this. I certainly won't ask for a change seeing how well Julia's rash is doing. According to Dr. S., we shouldn't be seeing any improvement in the rash for several more months at least. Finally, we were just chatting about Julia's case in general. Dr. A.W. said that Julia's case of JDMS is just about as mild as they get. This is partly because we're lucky that is just isn't a severe case, and partly because we caught it so early in the course of the disease. Julia got her usual 20mg of Methotrexate today, and sure enough she was complaining about being tired all afternoon, despite having had a good night sleep last night and no unusual physical activity. This is starting to bug me. While sitting in a restaurant today, we noticed that Julia's rash seems worse - her face is red, her blotches are bigger and redder, and her hands have some obvious bumps on the backs of her fingers. We will have to ask about this at the hospital this week. Time for our monthly visit to Children's Hospital. This was our shortest visit yet - we were out of there in less than 90 minutes. Julia weighed in at 31.4 kg, or 69.3 pounds. Wow! This is actually fractionally less than last time (31.6/69.6)! Her height also increased fractionally, to 123 cm/48.5". This is great news. Dr. S. said that as we continue to get Julia off the Prednisone, she'll resume growing again and "grow into her weight". Her blood pressure was about the same as last time, 129/64, and is no further cause for concern since we are tapering the Prednisone. Dr. S. said that her face looks "really good" and that her strength was excellent, at a completely normal level. The rash that looked worse on Sunday looked better today, although some of the bumps on her fingers are still visible. Dr. S. said that this worsening of her rash was definitely cause by sun exposure. Even with sunscreen, it only takes a relatively short exposure to inflame her rash because she's much more sensitive to the sun because of the Plaquenil. He recommended that we get Julia some sun-protective clothing, especially a hat to wear outdoors all the time, and gave us a brochure from one such manufacturer to look at. At the end of this week, we're going to check the results from her blood work taken today, and if they're acceptable, we're going to continue to taper the Prednisone at the rate of 2mg per day once a week, until we hit 6mg a day. Julia really has been sprouting the hair on her back and forehead lately (we're considering having her try out as an extra for a Planet of the Apes movie :), but he said that would all begin to just fall out once the Prednisone level gets to about 0.2mg/kg (or a dose of 6mg/day) or less. Her current dose, 16mg, is about 0.5 mg.kg. Therefore, if the blood work is OK this week, we'll be down to 6mg early in August. Cool!